About : A HIGHLY recommended item for hiking in Glacier National Park, as bears are plentiful and guns are not allowed. Use it to deter charging Grizzly Bears by spraying this pepper spray into their eyes. Available from Amazon. About : Completely revised and updated, this guide features more than 850 miles of trails for discovering Glacier and Waterton Lakes. Lists hikes for all abilities. Glacier National Park is home of a sizable and healthy population of wildlife, including grizzly bears. Bear sightings, either their tracks or the bears themselves, are relatively common on many of the hiking trails in Glacier National Park. While grizzly bears can be found anywhere in Glacier, trails in the Many Glacier Valley (Iceberg Lake Trail, Cracker Lake Trail, Grinnell Glacier Trail), on Huckleberry Mountain and in the Logan Pass Area (Highline Trail, Gunsight Lake Trail, Hidden Lake Trail) tend to have the most grizzly bear sightings. The high amount of bear sightings on these trails is due to these trails popularity, the open nature of the trails that provide extensive views, along with the fact that these trails cut through some very prime grizzly bear habitat. When hiking in bear country, it is highly recommended by Glacier Park officials not to hike alone - groups of 3 or more are recommended. The noise, due to talking among people and footfalls from several people, usually alerts a grizzly bear to the approach of people. Generally, the grizzly bears in Glacier do their best to avoid people and will get off the trail with the approach of a hiking party. There are, however, some bears in Glacier National Park that have become more acclimated to people. These bears are the ones usually spotted hanging out on the trails themselves and show no desire either to vacate a trail or show fear of humans. While these bears are the most dangerous of the bears in Glacier, they generally pose no problems for hikers in groups. These bears usually just want to be left alone and will seldom bother any hikers in groups. On the remaining section of this page, we'll cover tips on hiking alone in bear country. On the next page, I'll provide some tips on How to Survive a Confrontation With a Bear. Hiking in groups is fine. 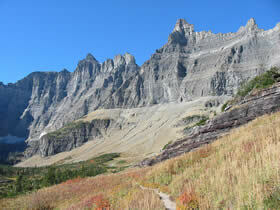 However, don't despair if you arrive in Glacier alone and want to take in the backcountry hiking. I have done almost all of my hiking in Glacier alone and so far have survived to tell the tale. During my hikes in Glacier, I've had two "bump ins" with grizzly bears at close range and have seen several other grizzly bears from a comfortable and safe distance. On my hikes, I've learned a few things about hiking alone so will offer some suggestion for solitary hikers on how to both avoid bears and survive a confrontation with one. As a result, solitary hikers need to be prepared for contingencies that large hiking groups often don't think about as well as applying a little more common sense than is often exhibited by hikers in large groups. That all said, there are a number of things solitary hikers can do to reduce the likelihood of bad bear encounters and a bad hiking trip in general. First, let someone know where you're going if at all possible. I'm generally guilty of letting no one know where I'm going, which isn't a huge deal if out on short day hikes. However, if you will be venturing far into the backcountry of the park or on an overnight trip, letting someone know where you will be and when you will be back is always a good idea. Second, and most importantly, be ALERT. Mindless hiking, with your eyes looking down on the ground beneath you, is a wonderful way to bump into a bear - literally. It is crucial to pay attention to where the trail is going and to pay close attention to what is on the trail ahead. This is especially true when going around sharp, forested corners. Going around "blind" corners slowly and alertly can go a long way towards reducing surprise bear encounters. Being alert has allowed me to avoid several bear encounters I would have probably otherwise had. Thus, if you are hiking alone, do NOT wear your iPod or blast loud music (you need to hear what is going on) and always keep your eyes on the trail. Third, when hiking more popular trails - especially during the summer - one good tactic I use is to fall in behind other hiking parties. I won't actually hike with these groups. Instead, I'll stay a couple hundred yards back or so, letting the larger group act as a "snowplow" of sorts. The larger group will alert the bears to the presence of people, allowing the bears to get out of the way. Since I will be not far behind, the bear is unlikely to venture out onto the trail so soon after a large hiking party passes. I have never seen a grizzly bear using this hiking tactic. Of course, this tactic only works on popular trails or during the summer - when every trial in Glacier at times seems popular. During the spring, the fall and on the heavily forested trails in the North Fork area of the park, using the snowplow tactic really can't work. When hiking in these conditions, besides being alert, your next best weapon is to make some noise. And by noise I do not mean those aggravating and by and large useless bear bells. Bear bells, in case you're wondering, are these little bells that many hikers wear on their packs. These bells make noise as you hike and thus theoretically help you alert a bear to your presence. Problem is, the only time I've heard these bells is right when people who use them are right on top of you to begin with. The sound of these bells is both incredibly aggravating to listen too and also does not carry well. These bells are also completely useless in windy conditions and in open terrain. Moreover, these bells often give a hiker a false security, lowering their alertness which is much more important I believe. I and many other experienced hikers in Glacier National Park, think of these bear bells as "dinner bells" for the bears. Instead, a solitary hiker can do several things when hiking to make noise. One trick I use is to occasionally beat my walking staff against a passing rock. I use an aluminum hiking staff. I took the rubber tip off the bottom. When hiking in prime bear country, I'll give the hiking staff some good taps against the rocks that are found all along the hiking trails. The sharp sound this produces tends to carry quite far while at the same time is not aggravating to listen to over the course of a longer hike. When coming around a sharp corner in the trail, another trick is to give a sharp clap, either by clapping your hands together or by slapping your hand against something that makes noise. You don't need to do this for an entire hike - you'll end up with very sore hands if you do - but when going around blind corners it is a very good way to alert bears to your presence. A fourth tip for solitary hikers is to hike slowly. All of my "close up" bear encounters have been on the return from a hiking trip. Usually, the trip back down to the trailhead is "downhill", thus allowing quicker and easier hiking. As a result, I have recently slowed down my "downhill descent" to a moderate walk instead of a fast walk. The slower speed gives the grizzly bear increased time to become alerted to my presence and to give them time to get off the trail. Since starting to use this tactic, I've yet to see a grizzly bear on any of my hikes, although I've known that they were around. A fifth tip is to avoid any perfume, cologne or other smelly "topical" things. Grizzly Bears have an incredible sense of smell, and will investigate something that smells interesting. For example, don't use a scented sunscreen. Much to my amazement, I came across a Huckleberry Scented Sunscreen in a local department store in Kalispell (just outside of Glacier). While smelling like a huckleberry may be great for the Florida beaches, it is an absolutely wonderful way to attract grizzly bears from miles around when hiking in Glacier National Park. A grizzly bear in Glacier National Park primarily eats berries, so smelling like a berry is not recommended! Finally, stay alert! I said it before and I'll say it again. 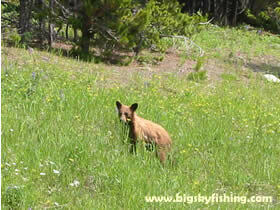 Staying alert is the best way to avoid problem grizzly bear encounters. Both of the times I've had problems with bears is when I've let my guard down. Both of my close up bear encounters came right near the end of the trail - less than 1/8 mile from the trailhead and the road. I let my guard down and didn't make any noise and walked very quickly and surprise - there the grizzly bears were! So, this information should help you avoid encounters with grizzly bears. However, if you do happen to encounter a grizzly bear despite all this, what do you do?